Speaking at the White House Monday afternoon during a meeting with Israeli Prime Minister Benjamin Netanyahu, President Donald Trump said he isn't backing down on issuing tariffs for imported steel and aluminum. "We're not backing down," Trump said, adding tariffs can be negotiated through changes in NAFTA. "We had a very bad deal with Mexico, we had a very bad deal with NAFTA." "I don't think we'll have a trade war," he continued. The President also tweeted about the issue Sunday evening and Monday morning. 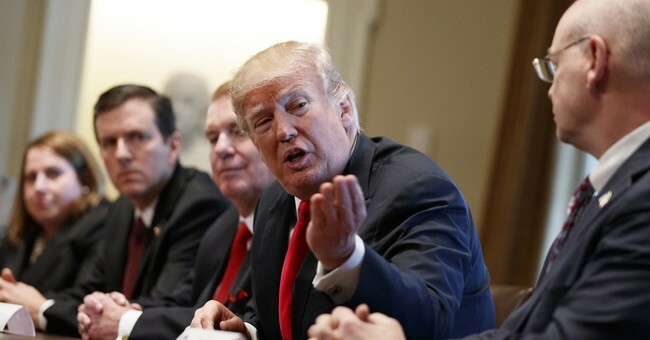 During a meeting with CEOs and business leaders from the steel and aluminum industries last week, Trump announced tariffs were imminent. "We'll be signing it next week. And you'll have protection for a long time in a while. You'll have to regrow your industries, that's all I'm asking," Trump said. "It'll be for a long time." Trump plans to sign a 25 percent tariff on imported steel and 15 percent on aluminum. The move has been roundly condemned by Republicans on Capitol Hill, who argue tariffs will increase prices for everyday American consumers, wipe out economic returns from tax reform and start a trade war. And it isn't just politicians expressing concern. Conservative, grassroots organizations are as well. “The Trump administration would mar its otherwise strong economic record by imposing these tariffs. These could be a lethal blow to all the economic success this administration has ushered in. Higher costs to producers and distributors of goods always get passed on to us, the consumers" FreedomWorks Press Secretary Jon Meadows released in a statement last week. President Trump has responded to criticism by arguing trade wars are good when there is an imbalance and that they are "easy to win."